Little did basket maker Edward Hill know that an order to supply 900 pigeon baskets would provide the foundations for a business that has thrived under the stewardship of his family since 1959, emerging as one of the UK’s leading manufacturers of quality willow products. Edward John Hill was born in Putney in 1901, having being abandoned by his parents at the age of 14 he was sent to work on a farm in Devon. Left lame after an accident, Edward developed his skills as a basket maker when the council put him to work at Blackwell’s in Braunton, Devon. 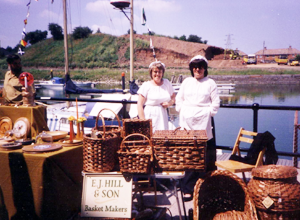 In 1930 Edward and his new wife Doris relocated to her home town of Bridgwater, where Edward first took a position with basket manufacturer Wills and then joined Geach, in North Petherton, where he worked for many years. In April 1958, Edwards’s eldest son Aubrey joined his father in Mr Geach’s employ. Unfortunately as work became scarce, both men were laid off just six months later and while Edward found work with basket maker Bill Carckett, Aubrey entered the building trade as a carpenter. In February 1959 father and son benefited from a stroke of luck. S Young & Sons of Mistertons, near Crewkerne, asked Edward to supply 900 pigeon baskets so they sold Aubrey’s car to help fund a new business, E J Hill & Son. The venture flourished until a ruling prohibiting the railways from carrying livestock all but killed of the pigeon industry and forced Edward and Aubrey to develop an alternative outlet for their skills. For the next decade the mainstay of E J Hill & Son’s business was garden furniture and picnic baskets, but by the time that Aubrey’s son Darrell came on board in May 1977, an order from Cameron Balloons of Bristol had prompted the company to take yet another change in direction. Hot air balloon baskets still feature in the company’s product range today. 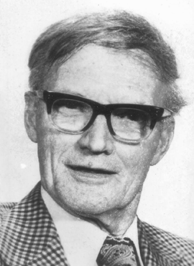 Edward Hill died in 1978, but the business was now well established and the 1980s heralded further exciting developments, including diversification into the manufacture of bespoke willow furniture for the discerning customers of Marston & Langinger and in October 1986, the move to its current site. The premises today look very different owing to a fire in 2001 – the largest ever seen in Bridgwater – which started in an adjacent unit, burned the factory to the ground and destroyed most of the surrounding industrial estate in the process. In 1988, following a change of name to The Somerset Willow Company, the business began to benefit from having a corporate identity. Customers distinguished Somerset Willow Company baskets as quality products crafted from locally grown willow, as opposed to cheap foreign made imports, and demand rose. The Somerset Willow Company marked the dawn of yet another new era in its long and colourful history in 1998 when it started producing their very first willow coffins. 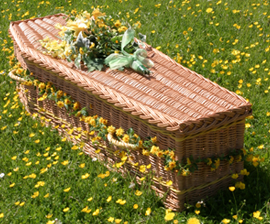 The environmental qualities of willow were well known to the company, but as the public became more aware of green issues, so the demand for eco-friendly coffins took hold. The first traditional shaped coffin that the company designed was made for Aubrey’s wife Stephanie and was a fitting memorial to her life. The Somerset Willow Company became a fourth generation family business in 2005 with the arrival of Darrell’s son Anthony. Although Anthony trained as a basket maker, the family realised he was better suited to management and he quickly became the driving force behind business development including the launch in 2008, of sea grass and cane coffins available through sister company Natural Woven Products. Originally, the company sourced willow from Durham’s of North Curry plus a handful of smaller Somerset-based growers, but in 2007, when owner Stan Durham decided to retire, the challenge was how to maintain supply. Darrell Hill took the decision to set up Somerset Willow Growers, in partnership with his old farming friend Richard Roberts, and purchased 20 acres of land already planted with willow, along with machinery and boiling tanks. At Richard’s farm in Westonzoyland the willow, once cut, is boiled, stripped and bundled all year round, providing sufficient stocks not only for Somerset Willow Company, but also for other basket manufacturers and hobbyists around the UK. In 2008 with the companies continued expansion and increasing work force, the opportunity came to purchase further units, adjacent to the existing factory. This helped to improve the storage and work space needs of the company. Edward John Hill would be proud that the Somerset Willow Company has not only prospered as a family concern, but that the company is acknowledged as one of the few basket manufacturers committed to maintaining traditional skills whilst also meeting current requirements. Every one of the basket makers the company employs completes a minimum five-year training programme, enhancing its reputation as a leading UK producer of consistently high quality willow products and service standards that are second to none.